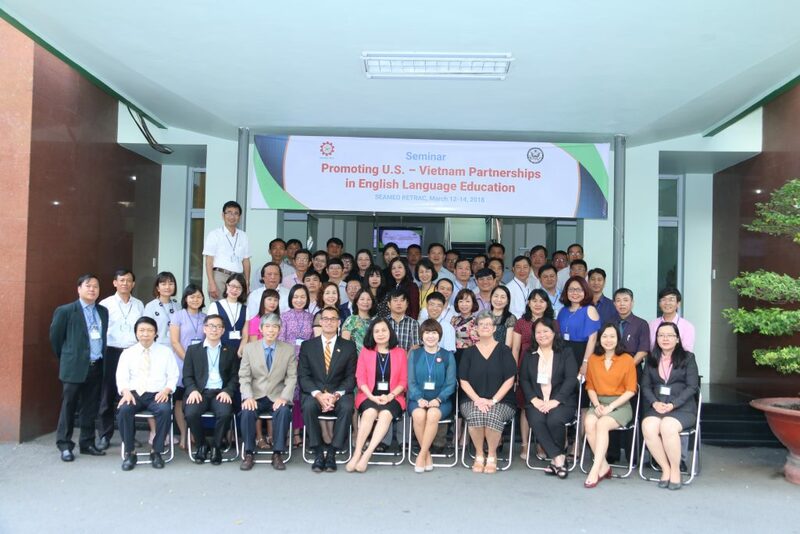 Seminar "Promoting U.S. - VIETNAM Partnerships In English Language Education"
The seminar hosted 50 English specialists from 48 of Vietnam’s DOETs & MOET. Participants learned about RELO & SEAMEO RETRAC’s teacher development programs, Webinars, E-Teacher Program, Fellowships, Specialist programs, and RETRAC’s International TESOL Conference. The specialists visited the American Center in Ho Chi Minh City for a sharing session on Education USA, YSEALI and the American Center’s available resources. Ms. Diane Millar, RELO Director, diligently facilitated the workshop, detailed the advantages of active training, and shared the procedures to conduct similar training programs for local teachers. Ms. Nguyen Thi Mai Huu, Director of the National Foreign Languages Project, presented about, “Teaching and Learning Foreign Languages in the National Educational System 2018 – 2025”. DOET specialists that already implemented RELO-supported training programs shared their experiences and supported continued professional development for Vietnamese language teachers.